Any bread you like will work: French, Italian, raisin, cinnamon-raisin, wholegrain or multi-grain. Bread that is slightly dried out works well. Beat eggs, milk, and nutmeg in shallow dish until blended. 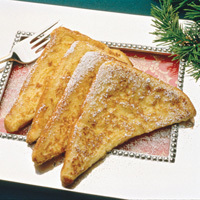 Soak 1 bread slice at a time in egg mixture, turning once, letting slice stand about 1 minute per side. Heat lightly greased large non-stick skillet over high heat until hot. Place as many bread slices in hot pan as will fit in single layer. Immediately reduce heat to medium. Cook until golden brown and no visible liquid egg remains, 2–3 minutes per side. Repeat to cook remaining bread. Serve immediately.